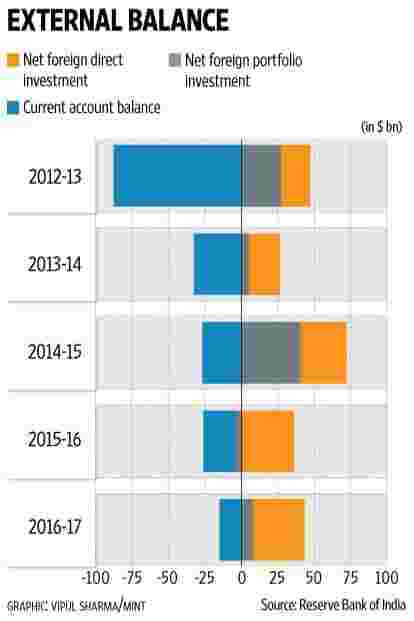 Over the past few years, one of the prominent features of India’s improving macroeconomic fundamentals has been the reduction in its current account deficit (CAD). After surging to 4.8% of gross domestic product (GDP) following the taper tantrum of 2013, CAD has declined successively, reaching 0.7% of GDP in fiscal 2017. Not just that, CAD’s financing has also become more robust. Prior to fiscal 2014, financing depended a lot on foreign portfolio inflows, a chunk of which is “hot money" that exits quickly, leading to volatility in the exchange rate. The good part is, foreign direct investments (FDI), which are way more durable and stable, have surpassed foreign portfolio inflows in the past two years. FDI often brings along benefits such as increased employment opportunities and greater technological know-how. Since fiscal 2015, FDI inflows alone have been sufficient to finance India’s CAD, and lately, positive portfolio inflows have been icing on the cake. For instance, fiscal 2017 saw net FDI of $35.6 billion, along with net foreign portfolio inflows of $7.6 billion. In the process, India has become more resilient to externalities, but it is not immune. Some old risks such as rising commodity prices and new ones such as trade protectionism are lurking. Rising commodity prices increase India’s trade deficit because we import way more than we export. For instance, while oil accounts for 11% of India’s exports, the share in imports is twice as much. Commodity prices, especially crude oil, started recovering since late 2016. The rise in shale production, however, has limited the rise in crude and ensured that CAD doesn’t get out of hand. Over the medium term, the bigger worry is higher commodity demand as domestic consumption improves and industrial growth picks up. According to S&P Global Platts, India appears to be entering a period of rapid demand growth for oil even as China’s appetite cools. And for the third straight year in 2017, India’s oil demand growth—at 7%—is expected to outpace China’s. Another risk is rising protectionism in advanced economies even as global demand improves. Increasing manifestation of this trend will impair India’s external position. That’s because the US and Europe constitute the biggest chunks of India’s merchandise exports. Their share has risen in the past few years to 15.5% and 13.5%, respectively, which, in turn, has increased India’s vulnerability to policy changes in these economies. Protectionist policies will also reduce India’s offshoring pie, affecting exports of telecom, computer and information services, which contributes about 48% to services exports. Immigration restrictions negatively affect the earnings of Indian workers abroad, which would reduce inward remittances. As much as 80% of the remittances to India are personal transfers, and 60% by workers. In the near term, however, protectionism is unlikely to have an impact on CAD since such political decisions take time. However, any rise in commodity prices will have an immediate impact—but again, not in this fiscal. Consequently, we expect CAD to rise to 1% of GDP this fiscal, 30 basis points more than last fiscal. Coming to the fiscal health of the Centre and the states, there is a trend reversal. The Centre’s fiscal deficit has fallen from 5.8% of GDP in fiscal 2012 to 3.5% in 2017, while that of states has risen. The situation could worsen further for states, leading to a higher combined deficit. Will that have adverse consequences for CAD? Not necessarily. Economic literature on running the twin deficits offers mixed reviews. John Bluedorn and Daniel Leigh, in their 2011 International Monetary Fund paper titled Revisiting the “Twin Deficits Hypothesis: The Effect of Fiscal Consolidation on the Current Account", for example, noted: “On the one hand, a standard implication of many theoretical models is that a fiscal contraction leads to a depreciation of the real exchange rate and an accompanying fall in the current account deficit. On the other hand, empirical research suggests that such a twin deficit link is weak or non-existent." In other words, a rise in consolidated fiscal deficit may not automatically lead to expansion of CAD. So while external risks can push up CAD mildly, buoyant capital flows and their mix are a source of comfort for India. The increasing skew in capital flows towards FDI reduces our dependence on portfolio flows, which can turn volatile in a risk-off scenario. Overall, India’s balance of payments account is expected to remain healthy over the near term with CAD at moderate levels and adequately financed. Dharmakirti Joshi, Adhish Verma and Pankhuri Tandon are with Crisil.